2019 has only just started and we’re taking this chance to sneak in a few more resolutions you can stick to this year. 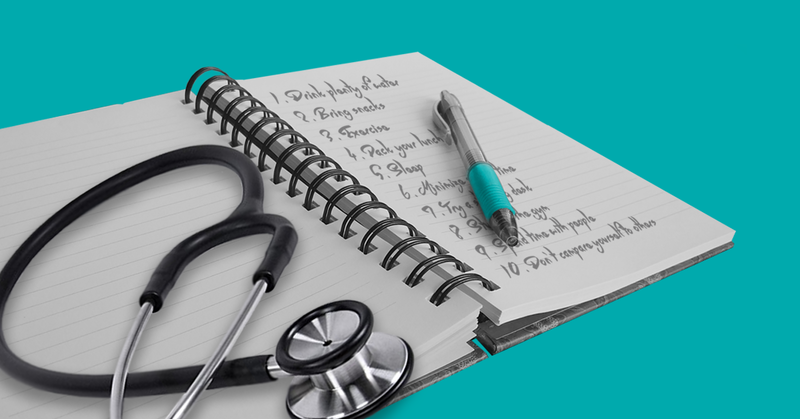 Sarah Martin, an M3 at Wake Forest, offers her tried and true tips on how to manage your med school stress as you jump between your studies and work on the wards. The New Year is a great opportunity to set goals for the year ahead; it’s the perfect time to refocus on mental and physical health. As medical students, we spend the majority of our time focusing on the health of our patients; I have found myself in the clinic with a patient discussing at length the health benefits of sleep, a balanced diet, and exercise. Little do they know I slept 5 hours the night before, ate peanut butter crackers for lunch and was about to head back to the library that night to sit for three hours. This is just a little reminder that your own body and mind need care, too! We’re all busy, which makes it hard to fit in exercise and healthy eating. However, there are simple things that you can do to keep yourself healthy as a medical student. Seize the chance to start fresh this year, and remember that you can only help your patients when you are healthy and happy yourself! Staying hydrated is crucial, and I have found that staying hydrated helps me avoid headaches and stomachaches. It’s difficult to carry a water bottle with me during Rounds, so I try to get in at least one glass with breakfast. I also keep a bottle nearby while I am studying to remind myself to keep drinking! Days at the hospital can run long, especially in the OR. Plan ahead and bring lots of nutritious “brain food.” Some of my favorites are cheese sticks with apple slices, peanut butter and celery or a banana if you’re on-the-go. Protein bars are easy to stick in your white coat pocket so that you always have something with you. This doesn’t mean that you have to run a half marathon every weekend. Easy ways that I stay active during the day include taking the stairs when I am walking to see patients, walking the longer way through the hospital when I have time or parking further away if I drive to work early. Meal planning every Sunday has been a game changer for me since starting clinical rotations. Packing balanced, nutritious lunches keeps me energized throughout the day. I try to incorporate lots of vegetables, grains like quinoa and a serving of protein. It helps me save money as well! This is one of the hardest ones for me to do on a regular basis. Sleep is so important for your focus and memory, so try to establish a regular routine whenever you can. Every person is different—you might feel better with eight hours, whereas your classmate may feel refreshed with six. Whether at the hospital or at home studying, we spend the majority of the day looking at computer screens. Try taking frequent breaks and avoid your bright computer screens as much as possible right before bedtime. The new way to get around the glare is anti-blue light glasses, which both prevent headaches (and make you look smarter!). The old-school way is to change your phone or computer screen settings so that the display tones become warmer after a certain hour. I loved using a standing desk during my Step 1 study period. I lose focus while sitting in my desk chair after a couple of hours. Standing allows me to fidget and still get work done. My standing desk also only has room for a notebook or textbook, which keeps me from absentmindedly reaching for my computer to check emails or Facebook. Walking on a treadmill or spinning on an exercise bike is a great place to review a study guide or flip through flashcards [or recommended Learning Cards] on your phone. It’s a “two birds with one stone” type of deal, and the workout will also wake up your brain to keep you studying efficiently after you finish. Medical school can be an extremely isolating place. If you study best on your own, or if you have a rotation where you are the only student, it can feel very lonely. Be intentional about getting together with friends for meals or other activities. It can feel like you don’t have enough time to squeeze it all in when studying, but you can combat this by scheduling study sessions with friends. Bring some snacks along and it’s a party! This last tip is one that we are all guilty of from time to time, but avoiding comparing yourself to others is healthy for your mind and body. Try as best as you can to focus on your own path. Medicine is a team sport, so instead of focusing on competition, look for ways to build up your fellow students and teams on the wards. When one person succeeds, you all succeed. We are all following our own unique path to our future careers, so don’t get caught up in trying to be just like the person next to you. So there they are, my top tips for staying healthy, mentally and physically, while crushing medical school this year. Try picking a few to focus on for a few months at a time, or let this list inspire you to come up with your own ideas. Best wishes for a happy and healthy 2019! 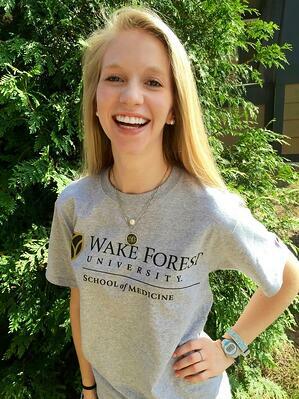 Sarah Martin is a third year medical student from Wake Forest School of Medicine who is pursuing a career in Pediatrics. When she's not spending time at the hospital, she loves to go to exercise classes, bake cookies and play video games with her sister.